Water wise gardening – You can reduce your costs AND stop dragging garden hoses around for hours every few days. Check out this resource from our City of London experts Growing Naturally. 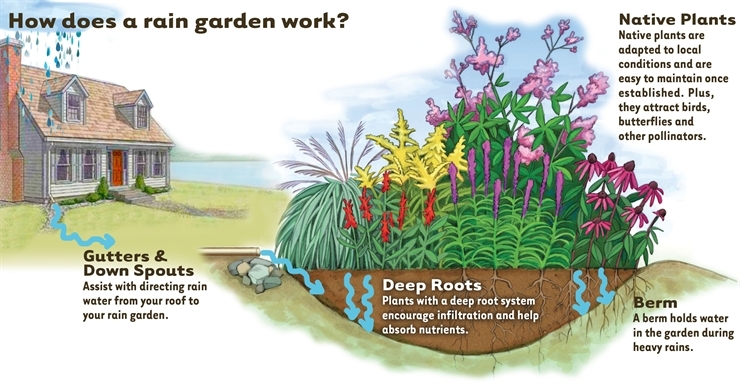 Here are some steps we recommend to conserve water and still have a great garden! Did you know that sprinklers typically use 950 litres of water per hour? Your lawn is not as thirsty as you may think. It only requires 2.5 cm (1 inch) of water in one week period – use a rain gauge, marked tuna can, or frisbee to measure how much water your lawn is receiving. The sun is at its most intense between 10:00 AM – 4:00 PM. 40% to 60% of water applied to lawns and gardens during that time will evaporate! Water your lawns and gardens in the early morning or evening. It is cooler and there is less wind. Leave grass clippings on your lawn. They will discourage weeds, help to retain moisture, and replenish the soil with nutrients. Watering in early mornings or late afternoon; never at night. Watering at the base of plants whenever possible to avoid wet leaves that are more susceptible to fungal diseases. Using drip irrigation or other methods that avoid splashing the soil onto the leaves and stems which results in transmission of spores and disease. Soil amendments – organic matter in soils vastly increases the water-retention capabilities. Incorporating 5-7 cms (2-3 inches) of compost or well-composted manure into your beds will reward you with healthy growth and reduce the need to water. Healthy plants are also more immune to disease! Mulch – covering the soil is perhaps the most effective way to reduce water needs. Evaporation is reduced and temperatures in the soil are modified. Add 5-7 cms (2-3 inches) of cedar mulch to all shrub and ornamental beds. It looks great, reduces evaporation and keeps the weeds down too! More Mulching tips. Collect or Divert FREE water – rather than allowing massive runoff into storm drains, why not harvest rain whenever possible by directing your downspouts ? Ideas include Rain Gardens and Rain Barrels. Lots of great ways to conserve and still have a beautiful and bountiful garden. Let’s all do our part!